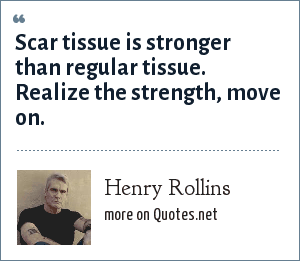 Henry Rollins: Scar tissue is stronger than regular tissue. Realize the strength, move on. "Henry Rollins Quotes." Quotes.net. STANDS4 LLC, 2019. Web. 24 Apr. 2019. <https://www.quotes.net/quote/73954>.